Next year is the 25th anniversary of REAP, so the meetings will reflect on REAP’s accomplishments. They will also look to the future. The Iowa Department of Natural Resources has prepared a new series of fact sheets highlighting the impact of Iowa’s most important conservation programs, REAP, or the Resource Enhancement and Protection Program. 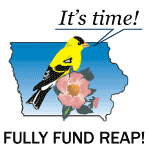 The fact sheets show how nearly all of REAP’s funding, which comes from Iowa’s Environment First Fund (Iowa gaming receipts) and from natural resource license plate sales, is distributed among eight different programs in the form of grants. They are now available for download as .pdf files. “REAP is as relevant today as it was 24 years ago, and the needs are still as great,” said Krausman. All 18 assemblies are open to the public and will have open houses from 6 to 6:30 p.m. The assembly will be held from 6:30 to 8 p.m. REAP received $16 million for fiscal year 2014 (July 1, 2013 to June 2014). In addition to projects that enhance and protect resources, funding also goes to enhance soil and water quality, historic preservation, roadside vegetation and several other programs that are beneficial to Iowa. REAP has funded projects in every county in Iowa. People can get involved in REAP outside the assemblies as well. “Most counties have a REAP committee where, if they want to talk more about these things, they can,” Krausman said. Meeting locations and dates are listed below alphabetically by city. Additional meeting details can be found at: http://www.iowadnr.gov/Environment/REAP/REAPPublicParticipation.aspx. This entry was posted in Community News, Conservation funding, Water and tagged conservation programs, DNR, REAP. Bookmark the permalink.